A Las Vegas-Type Experience, but Beachfront! 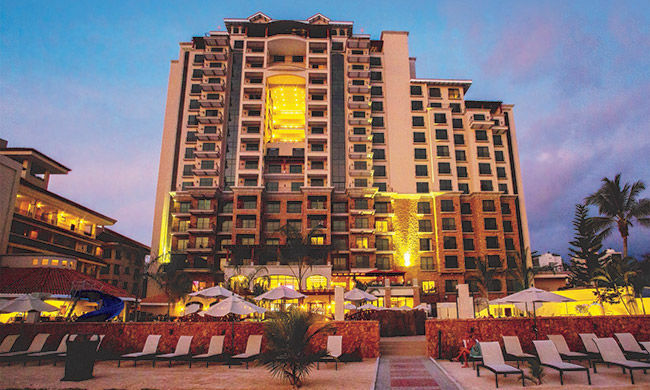 Located in the coastal province of Puntarenas in the beach town of Jacó, the Croc’s Casino Resort is 17 stories of luxury flanked by rainforest and beach. Croc’s is the ideal choice for those looking for the full resort experience with so many amenities you won’t even need to leave the property, except maybe for a walk on the beach or to explore the town. Rooms are spacious and elegantly designed using warm colors that compliment the surrounding landscape. Each room offers upscale amenities like a mini-fridge, evening turn-down service, and 24-hour room service, to name a few. WiFi is available in the rooms and throughout the property. The 5-star pool and surrounding Jacuzzis, lounge areas, and slide were featured on GoVisitCostaRica.com as one of the 5 best in Costa Rica. In addition, the Las Vegas-style casino features slot machines and table games at a level new to Costa Rica with a bonus ocean view. Order a drink from Liquidity Bar and watch the sun go down as you try your luck. There is plenty of fun to be had with nightly entertainment, a disco club, and even a crocodile habitat where you can visit Paco and Lola, two caiman that were rescued off a nearby beach. On the second floor, do some shopping, either for yourself or for the perfect gift to take home. For pampering, visit the Carara full-service spa and beauty salon for everything from a mani/pedi to a mud wrap and anything in between. Your taste buds will never get bored with three restaurants and two bars where you can sample all types of cuisine. For a Mediterranean menu in a fine dining ambiance, head to Adacus for lunch or dinner. If you prefer a more relaxed, family-friendly feel, Parsley and Pepper is the place for you. Open all day, there you can order international dishes a la carte and even have a kids menu for little ones. El Zarpe Bar & Grill is located poolside and has a varied menu and plenty of cocktails to choose from. And if you need a gourmet cup of Costa Rican coffee, El Cafetal serves only the best! Crocodile habitat where you can check out two rescued caiman in their new happy home. A spectacular pool area that has bridges, a slide, and plenty of places to lounge. On-site casino that one-ups Las Vegas with its ocean view—a great place to watch the sunset! So many hotel amenities we can’t even list them all!